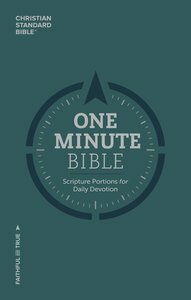 The CSB One Minute Bible takes the frustration out of daily Bible reading by carefully arranging key biblical texts into 366 daily one-minute readings that will inspire, encourage, and challenge you in your daily walk with the Lord. From Genesis to Revelation, you will discover new insights through these simple, yet profound readings, and each portion of Scripture has been carefully selected to keep the meaning and context of the message clear and concise. The CSB One-Minute Bible features the highly readable, highly reliable text of the Christian Standard Bible (CSB). The CSB stays as literal as possible to the Bible's original meaning without sacrificing clarity, making it easier to engage with Scripture's life-transforming message and to share it with others. About "CSB One Minute Bible: Scripture Portions For Daily Devotion"